Our beautiful, award winning hydropool is located in Chelsea London and won the gold award at the British Pool and Hot Tub Awards 2015. Hydropool swim spas have the benefits of both luxurious hot tubs and full size pools. With a unique swimming area and AquaFlow Swim Jet, you avoid hitting your feet on any hidden obstacles such as steps. Our pool is specially designed with anti-slip flooring and the swim area allows for a variety of different activities. You can swim against the swim current which allows you to adjust to your own preferred level. Control your workout intensity, movement and speed with the hydropool, which specifically matches your needs, thus creating the prefect training environment. 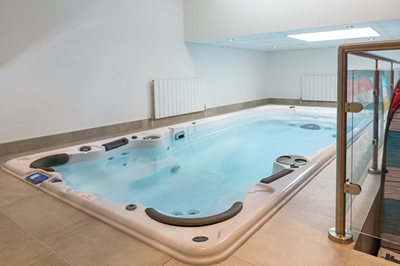 The hydropool has a Sonos Audio Surround System so you can listen to your favourite music while relaxing or training.